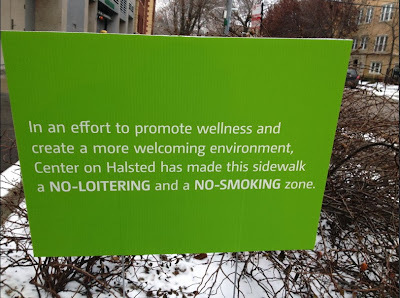 CWB Chicago: SIGN OF THE TIMES: Center On Halsted Establishes "No Loitering Zone"
SIGN OF THE TIMES: Center On Halsted Establishes "No Loitering Zone"
The Center On Halsted gave the neighborhood a little stocking stuffer this week. 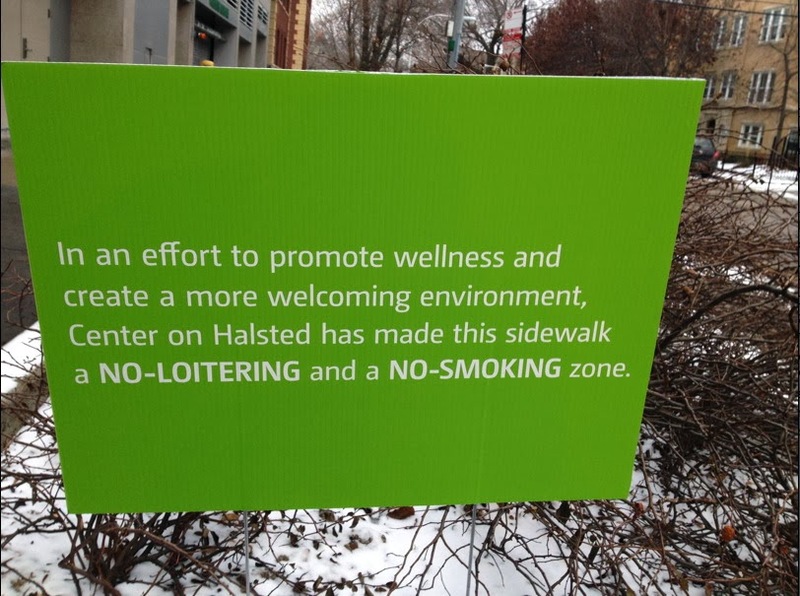 According to several readers, three signs declaring the Waveland Avenue side of the community center to be a "NO-LOITERING and a NO-SMOKING zone" went up in the past few days. The signs indicate that the new policy is "an effort to promote wellness and create a more welcoming environment." This is the area where people have had many problems walking through the loitering crowds hanging outside COH…It is a change of policy by COH but will likely still have to be enforced by security. No problems yet though. I saw one guy hanging out tonight but he was alone. It will be interesting to see how long those easily-removed signs will remain in the possession of COH, how effectively the Center enforces their own policy, and, of course, if their clients will be more inclined to loiter when the temperature is significantly higher than 13°.